This listing makes a lot of sense when the same website mentions a localisation for the Switch version of Layton’s Mystery Journey: Katrielle and the Millionaires' Conspiracy, which was rated by the Australian Classification Board in February and released in Japan last year. ...Well you told me to tell you! I'd love to get a trilogy collection of the first three DS games, personally. No replay for me. Just play for the first time if it comes to the Switch and I won't judge the price the developer asks. It's his creation and he will charge as much as he feels like. And I don't care if it's gonna be digital only or physical. A sure buy from me in whatever form it comes. I'll pick up Katrielle on day one, but I think I might be more inclined to skip any rereleases of the Layton games unless they are released at retail (ideally in the form of a compilation release). I've never gotten the chance to play the Laytom games, so I'd love to dive into the series on Switch! If it's priced appropriately then yup, I'd get it. I've still never played a Layton game and want to give one a try. If this, along with potential ports of the other DS ports, are $40+ each I'll pass. All three for $60 would have been worth it though. Day one purchase for me. I love this franchise! With this and the Ace Attorney games arriving on the Switch, wonder if a port of Prof Layton Vs Ace Attorney will be coming at some point? I'm playing The Unwound Future/Lost Future this moment. Love the series but never got too far. I wonder if they'll put Professor Layton in Smash to go with it. Layton needs some time in the spotlight! I'll definitely buy this one as well. Only ever played Miracle Mask, Azran Legacy, and Unwound Future, so a Curious Village remake would be perfect for me. Replay, no - I've done all the stuff on offer and have even managed to start Diabolical Box since. But I'll be damned if I expected a chance to actually get this game. On Switch, no less. Good news with some room for daring to hope the other two DS entries might sail back into view one day as well. I sunk In 7 or 8 hours into the curius village and I enjoyed the time I spent with it. Solid soundtrack, setting, art style, characters and the quirky charm that the village evoked were fabtastic if nostalgia serves me right. Nice, Ive only played Miracle Mask and it was great. They should bring Layton Brothers off of mobile phones. Played all 8 Layton games except the mobile exclusive one. One of my favorite franchises. I think it’s time for a new entry. My original game cartridge broke (somehow... only cartridges I've ever had break since the GB), I'd gladly buy it again for Switch. I recommend these games (especially the original trilogy) to anyone that loves puzzle and mystery games. I probably won’t repurchase them despite it being one of my favorite series, but honestly I don’t really enjoy replaying puzzle games as I tend to remember most of the puzzles and it defeats the purpose. Nice. It's about time these quirky adventure games started showing up on the Switch. All I want now is a new Hotel Dusk or similar game, from Taisuke Kanasaki on Switch. I think I'd prefer a compilation with all the DLC puzzles, personally, but if this is reasonably priced, $20 or less, I'd be in on a double-dip. I've tried the movie, Miracle Mask, and the Ace Attorney crossover and I just can't get into this series. Feels like something I would like but I just... don't. I love the Professor Layton series it has the Agatha Christie style mystery novel feel to it at times. I feel like this series would really benefit from a collection package, they were great games and I wouldn't mind playing them again. Oddly enough I never got around to playing this series on DS, so I’d gladly give them a go on Switch, if the price is right. Professor Layton and the Curious Village! I own all the other titles but not the original first one. It is a must buy for me! Even though i bought it already on Smartphone, i happily would buy it for Switch again. Besides Ace Attorney one of my absolute favorites for (3)DS.. Yes, I'm very interested in playing Layton games on Switch! I've never played one of them all the way through, but have loved what I've played of them. I struggle to imagine how well the game would work without stylus controls. I absolutely adore the series, but it's best on DS and 3DS. The first Layton was always my favorite! I hope they've kept the original artwork around in high enough resolution, that they don't have to redo all of it. factor 5 has financial struggles, lets hope for these guys the can bring out the triology and it sells like hotcakes. i would certainly buy all three of the games. the switch is even a better platform for these games then the ds and 3ds was. but no easy task if yoy ask me, graphics and sounds has to be updated. Nice! Will buy if it gets a retail release! @RainbowGazelle The Switch version of Layton mystery journey works well enough, so I don't see why the older games can't work. Its not quite as good as the stylus but its not problematic. Na, not for me. Be cheaper buying an old DS and the original game probably. Upcycling something like Links Awakening I can get behind as it’s a major upgrade but this?!? Release something new for pities sake before the estore becomes a mass of shovel ware and rereleased relatively recent games trying to make a quick buck. As others have said, I'd much prefer a trilogy compilation. Unless it somehow is sold for only $10. I'll buy it for $10. Never played this before, might give it a try depends on the price & my mood. @Wavey84 You took the words out of my mouth. 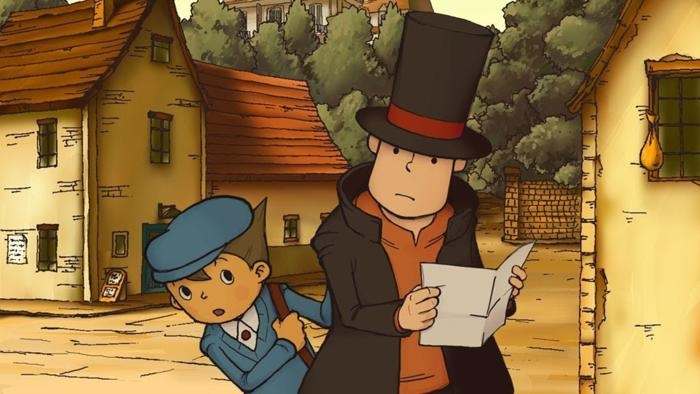 While I played a couple Layton games for several hours, and liked them, ultimately they were not for me. Proper Layton! None of this watered down Katrielle nonsense. I like the Layton games a lot but I have no desire to replay any of them. The stories are a bit convoluted and get a touch long in the tooth and I don't want to sit and solve hundreds of puzzles I've already solved again. If they want to bring out a new one though I will buy it in a heart beat! I might double-dip on this one, but it will depend on the price; I still have cartridges for all six original games to play on my 3DS, so I might pass if it’s more than £15-20. If we were talking about a collection of all six games, on the other hand, I’d happily spend full retail price. I won't buy it a second time but I highly recommend it to everyone who hasn't played it, yet. This also reminds me that I still haven't finished Professor Layton and the Azran Legacy. I should really get back to that. I am not sure. I have it on DS and never finished it but I love the game. I bought it when I worked 80-90 hours a week as a professional Gigolo so I did not have the time or energy to play it. May be now that I am less active I will go back. On the Switch might be nice but the price determines it for me. I would love to play the Professor Layton games for the first time on the Switch. I did read the Katrielle isn't as good, so I'd give this one a pass. Reading the title of this article gives me a headache. I probably will, Curios Village is the only one I don’t have in my collection! Looking forward to the remastered cutscenes since the sound quality is heavily compressed on the Nintendo DS. Also, if this is based on the mobile HD remaster then I'm also curious to see the new animated cutscenes that they're going to add, I'd like to see more of Flora. As someone else mentioned before, I'd rather see a trilogy collection of the first three Professor Layton games as well. However, only Curious Village and Diabolical Box have been remastered on mobile, so I'm willing to wait until Unwound Future is also remastered for them to bring all three titles into one package rather than having to purchase them individually. I've played through the original Layton trilogy but wouldn't mind grabbing this game as I don't own it; the DS copy that I played was borrowed. I still need to play the prequel trilogy at some point and play Millionaires' Conspiracy as well. @Hunt3r_Cr0wl3y Lady Layton costs $16 on mobile, but that didn't stop the 3DS version from costing $40 either. Still haven’t finished Azran Legacy. I’d like to play any of them again on Switch, though, if they aren’t too expensive. I’d get both. I haven’t played the Katrielle one at all, and it’s been so long since the first one came out, many of the puzzles will probably seem new. I remember when I first started writing for Nintendo Life back in 2009 or 2010. I had mostly stopped paying attention to video games and I needed to do a lot of research to catch up. Two of the first series about which I saw news stories on here, and which I hadn’t even heard of before, were Phoenix Wright and Professor Layton. So they’ve always occupied a weird space in my brain. I never got around to playing any of the entries on DS or 3DS, but now that Phoenix and potentially this are coming to Switch, I feel excited and almost obligated to play them. I’m glad to finally be giving these series a try! @Hunt3r_Cr0wl3y Did you see ther price of Little Dew 2 on Switch? As well as many other games. I've always wondered why the game was never brought to the big screen (in docked mode anyway). It will work well for multiple players to solve puzzles together. What about the extra puzzles where you had to use Nintendo Wi-fi connection to unlock? Hopefully they'll all be available. Nice to hear the original is making its Switch debut. I hope many new people are introduced to this charming series. May finally pick up Mystery Journey if it does come to Switch. From the reviews I've read it appears to be a bit lacking in story/puzzle design (which is a bit concerning, considering that's basically the entire game o_o). Then again, nothing will ever quite live up to the original trilogy (especially UF!). I only played the first game and a puzzle or two from the second game so if they did a trilogy, I would buy for sure. If the new game get's released in NA, I would consider it. My wife is a huge fan of this series, but I’ve only played the first. I think the games would look great in HD, but the puzzles kind of work best with the DS’s 2 screen set up. I can’t imagine it working on a tv or a single touch screen. I’m surprised nobody else seems to have this concern in this thread. Solve the Puzzles Says Professor Layton! I finnaly got my own switch! I really love this game series and I've only played the curious village can't wait to play it again on the switch!